Lapwings tumbling aerial display and unmistakeable ‘Pee- wit’ call have heralded the arrival of spring in Upper Nidderdale for generations. Up until 40 years ago, these charismatic birds were to be found nesting on most farms throughout the country. Since then their population has fallen dramatically, and it is now listed as bird of conservation concern. 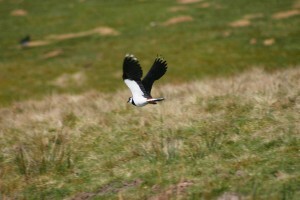 Upper Nidderdale remains a vital haven for them due to undrained wet pastures and protection from predators. Lapwing chicks are able to run around and feed for themselves within a day of hatching but they will be closely guarded by their mother who will lead them to the best feeding sites- these can be some distance away from the nesting site and she will brood them to keep them warm. The five week period between hatching and fledging is a particularly vulnerable stage for young chicks and many don’t make it. This is why is important to ensure that farmland provides all the requirements that adult birds and chicks and to give them the best chance of fledging and returning to the same fields to breed.